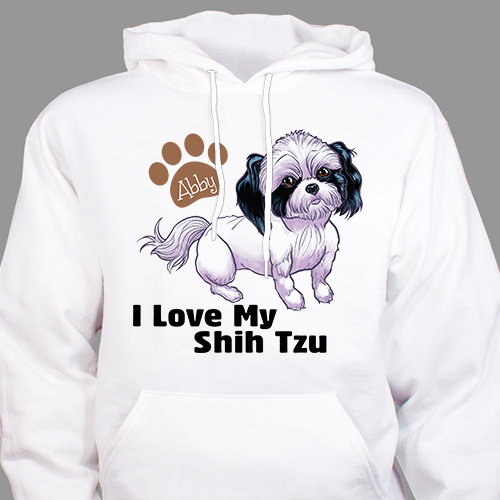 Stay warm, cozy, comfortable, and proud of your precious shih tzu whenever you wear this personalized hoodie around town. This pet lover gift would make a shih tzu owner happy, because it allows them to show off their favorite furry friend to the entire world. Our I Love My Dog Hoodie is available on our cotton/poly blend hooded sweatshirts, machine washable in adult sizes S-2XL. Free personalization of any name is included. Great hoodie couldn’t be any closer looking of my Bella. Additional Details Your friends and family who love showing off their shih tzu will be thrilled to receive this hoodie as a personalized gift from you! It's one of many shih tzu gifts we have to offer, but you won't find another as comfy as this one. Our Personalized I Love My Shih Tzu Mug would be a great gift to complement this one.